Although standards for Automatic Dependent Surveillance (Broadcast) (ADS-B) are still under continuing development, the concept is simple: aircraft broadcast a message on a regular basis, which includes their position (such as latitude, longitude and altitude), velocity, and possibly other information. Other aircraft or systems can receive this information for use in a wide variety of applications. The key to ADS-B is GPS, which provides three-dimensional position of the aircraft. As an simplified example, consider air-traffic radar. The radar measures the range and bearing of an aircraft. The bearing is measured by the position of the rotating radar antenna when it receives a reply to its interrogation from the aircraft, and the range by the time it takes for the radar to receive the reply. Figure 5-48. 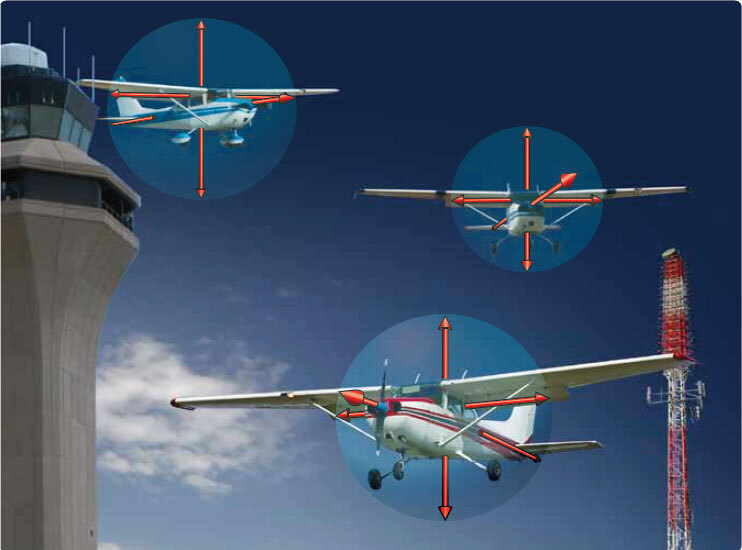 Aircraft equipped with Automatic Dependent Surveillance—Broadcast (ADS-B) continuously broadcast their identification, altitude, direction, and vertical trend. The transmitted signal carries significant information for other aircraft and ground stations alike. Other ADS-equipped aircraft receive this information and process it in a variety of ways. It is possible that in a saturated environment (assuming all aircraft are ADS equipped), the systems can project tracks for their respective aircraft and retransmit to other aircraft their projected tracks, thereby enhancing collision avoidance. At one time, there was an Automatic Dependent Surveillance—Addressed (ADS-A) and that is explained in the Aeronautical Knowledge Section. An ADS-B based system, on the other hand, would listen for position reports broadcast by the aircraft. [Figure 5-48] These position reports are based on satellite navigation systems. These transmissions include the transmitting aircraft’s position, which the receiving aircraft processes into usable pilot information. The accuracy of the system is now determined by the accuracy of the navigation system, not measurement errors. Furthermore the accuracy is unaffected by the range to the aircraft as in the case of radar. 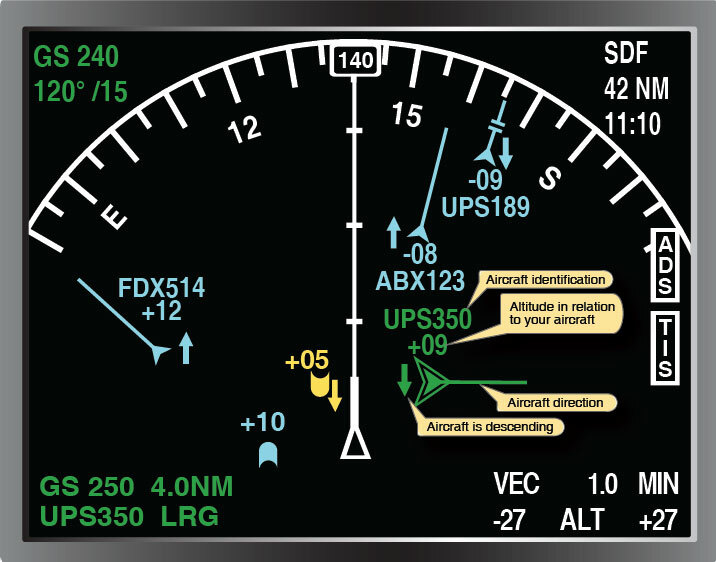 With radar, detecting aircraft speed changes require tracking the data and changes can only be detected over a period of several position updates. With ADS-B, speed changes are broadcast almost instantaneously and received by properly equipped aircraft. Additionally, other information can be obtained by properly equipped aircraft to include notices to airmen (NOTAM), weather, etc. [Figures 5-49 and 5-50] At the present time, ADS-B is predominantly available along the east coast of the United States where it is matured. Figure 5-49. An aircraft equipped with ADS will receive identification, altitude in hundreds of feet (above or below using + or–), direction of the traffic, and aircraft descent or climb using an up or down arrow. The yellow target is an illustration of how a non-ADS equipped aircraft would appear on an ADS-equipped aircraft’s display. Figure 5-50. 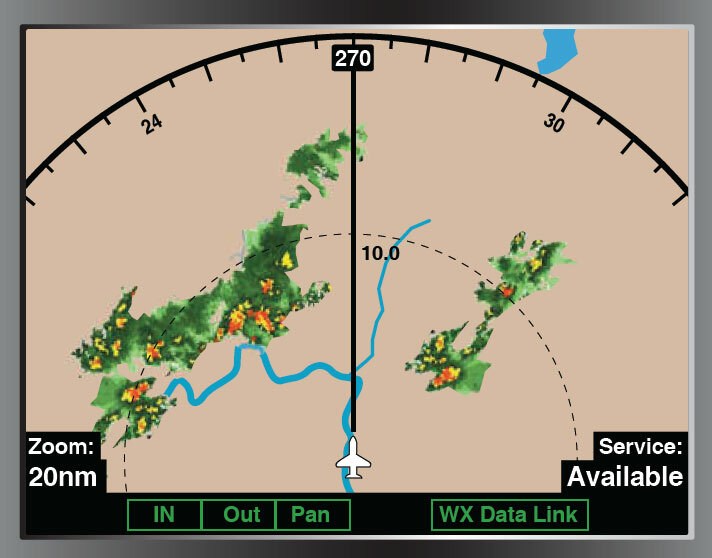 An aircraft equipped with ADS has the ability to upload and display weather.